Our tour to Albania began at 8:00am aboard the Nieuw Amsterdam. We collected our passports, left the ship (Corfu! Another “country” per TCC guidelines.) and went as a group to Greek passport control for our departure to Albania. The immigration department was completely overwhelmed and remarkably understaffed. It was a scene of mass chaos and utter confusion with numerous tour groups converging on this checkpoint. After 30 minutes or so, Libby and I made it through security and to the “Blue Dolphin” (our ship to Albania). By the time we made it to the (now late in departing) boat, the locals had already begun to rebel… yelling at the crew and otherwise complaining about “the Americans.” It was great! About an hour late, our hydrofoil departed. Next stop: Albania! Saranda is currently ongoing a building boom with the growth of tourism since the end of communism in 1990. We saw numerous hotels under construction, though tourism is still in its infancy. Most overnight tourists are Albanians, as well as people from Kosovo and Macedonia. Most others are “day trippers” like us from Corfu. Anyway, back to the infrastructure. The country currently only has one airport, nearly 300km away. Likewise, the roads are less than ideal: indeed, the road to Butrint was under construction, literally, while we drove in it. Due to the condition of the road, it took nearly an hour to drive the 24km to Butrint. 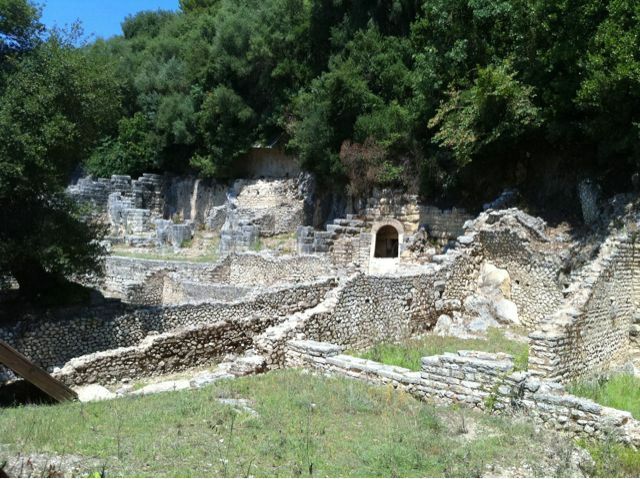 The park and archeological site at Butrint were very enjoyable. It contained ruins of the Greek, Roman, Byzantine, and Venetian periods–sometimes built on top of one another. We both found this milieu very interesting… as we didn’t know what would be around the next corner. Plus, the landscape–a forested park at the tip of a peninsula that smelled of wild bay leaf–was very captivating. On the route back to Saranda, we learned more about the history of Albania during the communist era. In particular, the years of 1976-1990 were ones of extreme isolation during which Albania had nearly no outside contact. Indeed, such outside contact (e.g., watching Greek television) and travel (e.g., entering or leaving the country) were prohibited. It remains poor. The average wage is only about $300/mo. But, the people are very happy to have their freedom and enjoy the progress they’ve made. We had a nice lunch at a castle overlooking Saranda and Butrint. After lunch, we drove back to the port of Saranda and boarded the hydrofoil for the trip back to Corfu. All in all, Libby and I were really impressed with Albania. It was a great day trip! Tonight, we had dinner at the Pinnacle Grill, HAL’s signature alternative dining venue. It’s sort of vaguely steakhouse themed. What can I say? Overall, it was good. But, we live in the “Land of Bern’s.” And, you can’t beat Bern’s. So for the money, it was worthwhile. Highlights: the French onion soup and Grand Marnier chocolate lava cake. Lowlights: the jumbo shrimp cocktail and Libby’s veal chop. My steak was good… as in above average but not great. After dinner, we booked ourselves (using the onboard cruise booking deal) for a 14-day cruise in Asia in 2012. We also booked Emerson on this cruise as well. After all, who doesn’t want to fly to Hong Kong with a two year old? Besides, she’ll be on the Antarctica trip with us in February as a one year old! It’s a good itinerary: Hong Kong to Osaka (I think)… via China. Later tonight, we are going to hit the show. We haven’t checked out the onboard entertainment yet. New update on the itinerary snafu: no optional tours to Slovenia. Also, the time in port is very limited (7am to 2pm). This means we will be going there on our own, with no real guidance, and without much information. I’m thinking we’ll just take a taxi or maybe a train from Trieste to someplace in The Karst region on Slovenia. For my intrepid traveling friends: suggestions posted on the blog (based on experience or Internet research) would be appreciated! Paul and Libby, your trip sounds great so far, except for the immigratiion department. We are having a great time in Chicago, and even got a complementary upgrade to a suite at the hotel. Take that Mr. Upgrade.